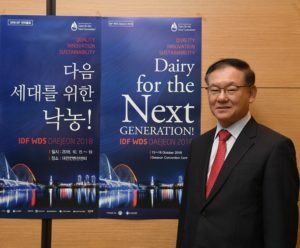 The IDF World Dairy Summit 2018 is a forum that brings together international experts to share their knowledge and expertise, and exchange ideas on enhancing the dairy sector, said President of IDF Korea, Lee Chang Buhm. He said the annual Summit which was launched today by former UN Secretary-General Ban Ki Moon in Daejeon, Korea, will benefit delegates through the opportunities to interact with their counterparts from other countries and learn from their development experience. Mr Lee, who also Chairs the Organizing Committee of the World Dairy Summit 2018, said the Korean dairy sector can learn from experts, policy makers, academics, producers and processors about policies, supply management and value chains. Korean exports to the region include ice cream, yoghurt, plain milk, liquid and milk powder, which is popular in China, said Mr Lee. He said Korean milk and dairy products are produced with high quality in food safety. He stated that processed milk powder, particularly infant formula, is sought after by Chinese consumers, which is encouraging to Korean exporters.